Working with our associate company AmbaFlex, we have the ability for customising materials handling systems by including spiral conveyor technology. The SpiralVeyor can be used in a wide range of markets and applications for vertical transportation, temporary storage and the accumulation of single goods and packed products, whilst being both flexible and cost-effective. We ensure increased uptime by offering global support and through our professional approach to co-operation. We prefer to work with our customers based on mutual respect and through a continuing dialogue. AmbaflexSpiralVeyors provide a continuous throughput whilst featuring the smallest footprint available; saving valuable floor space for an efficient system layout. As a standard, the spirals are fully reversible to enable feeding to or from various levels. Suitable for drums, cartons, boxes, totes, bags etc. Spiral conveyors are an ideal solution for those wishing to create space in their operations. Spirals are able to convey a substantial amount of product within vertical space and are noted for their modest energy consumption, using a small number of motors. When you opt for a spiral solution, you can simplify and therefore reduce costs for wiring, controls and installation. They are also highly-regarded for their speed. AmbaFlex is one of the world’s leading manufacturers of spiral conveyors, supplying first-class solutions for companies from a wide range of industries. 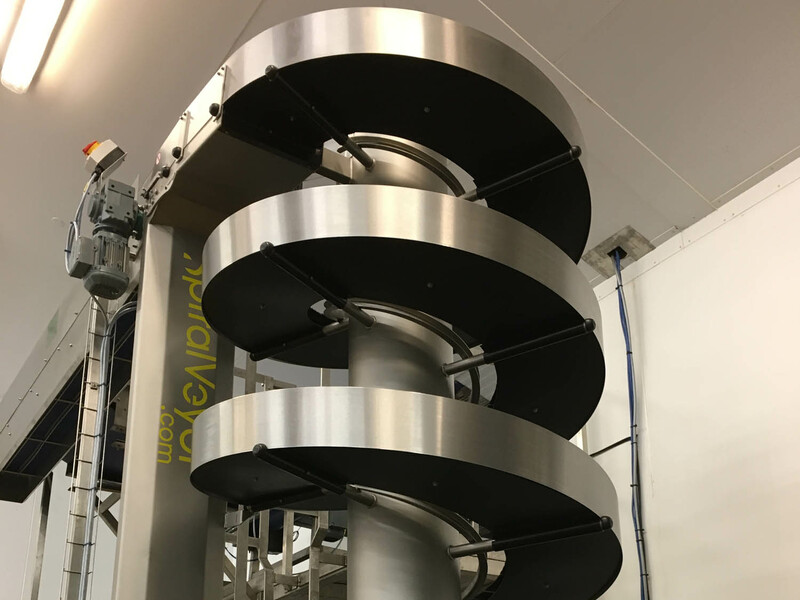 The SpiralVeyor features belts of medium width, with the SlimLine version being one of the most compact spiral elevators on the market. There are many different customisations available that will allow you to tailor the solution to your specific needs. Spiral conveyors takes up much less floor space than standard conveyors. The largest part of a spiral conveyor is the drum, which drives the belt. It is possible to obtain a spiral conveyor with just one belt to cut operational costs. These conveyors can move items upwards and downwards and allow you to transport items without steep inclines, which means opportunities for items to tip over are diminished. The motor is normally held inside the drum, which generates power for moving the belt. Spiral conveyors are frequently used in production lines in order to prime systems and buy time. Spiral systems from Asmech only require minimal maintenance, and we are always on hand to provide you with valuable advice on making the most of your solution. At Asmech, we have been providing clients with spirals and other forms of conveyors for many years. We are waiting to hear from you if you are interested in investing in a spiral conveyor system. Find out more by calling 01623 424 442 or sending an e-mail to sales@asmechsystems.co.uk, you can also reach us by completing the form on the Asmech website.